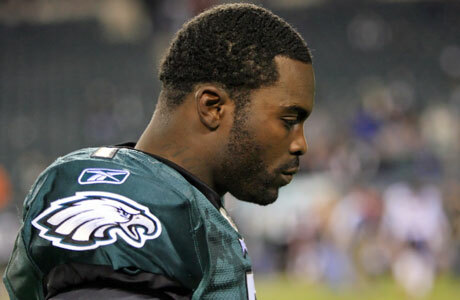 Michael Vick and I are a lot alike. Aside from the major differences, namely our age, gender, demographics, ethnicity, career, and physical stature, we’re pretty much the same person. You see, I was beginning to wonder why after all these mediocre outings by the Eagles, that I continue to insist that Michael Vick should be the starting quarterback. One person that was always there while I scrubbed beer off the bar, or balanced five plates of food in my arms, or when I took a second to massage my calves during a 12 hour shift, was Michael Vick. He brought constant excitement to my stagnant life. The Eagles had finally jettisoned Donovan McNabb after many years, and suddenly we had a new sheriff in town. But this wasn’t just any sheriff, this was one who was crawling his way back from a felony conviction, time served, and serious debt, just to name a few. For me, I needed this story. I needed a comeback like this one. In the back of my mind I always wanted to get back in the starting lineup again, I just didn’t know how. But Mike did. Mike had gotten back, and furthermore, Mike was on my team. I finally did make a push for the starting lineup. I moved away, finished school, and immediately found a full time position after I graduated, all within one year. I quit smoking, took up running, and make time every week for hobbies I enjoy. My life has done an about face. I also never miss a Sunday with my old friend, Michael Vick. The same year I made my triumphant comeback, Vick signed a $100 million dollar contract, to my beaming delight. Turning my life around is the equivalent of a $100 million contract, and for him it meant he truly returned. He could settle his old debts, and he could move forward. Just as I am. For three years, Michael Vick has been the penultimate example of losing yourself, making poor choices, suffering the consequences, and working extra hard to compensate. He was always there in the back of my mind, the shining beacon of success by way of experiential mistakes and valuable perspectives gained. He was never given a second chance, he worked hard and earned one. His efforts continue to resonate with me. So while the rabble rousers and media vultures gather at the gates of Lincoln Financial Field with their pitchforks in hand and demand Vick’s head on a spike, I am reminded that despite coming so far, adversity will always persist in life. As proud as I am of all my accomplishments, I can’t be naive to think that more will not be on the horizon. In this life, we continue to be knocked back, and there are always new challenges that require weathering. I try not to worry too much though, because like my friend Michael Vick, this isn’t our first storm.